6 September 2010, at 8:55a.m. 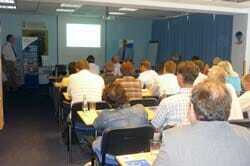 EU - Aviagen recently held two seminars for their broiler farmers in the Czech Republic and Slovakia. The events, which took place in Zvíkovské Podhradí and Velké Bílovice, focussed on practical advice to improve broiler performance. In total, more than 100 people attended the two sessions, mainly representatives from Ross broiler growers and feed mills across the two countries. The key speaker at both events was Nigel Joice, a long-standing Ross broiler grower in the UK, who shared his experiences in the UK, providing practical tips and advice, as well as offering an update on the EU Broiler Welfare Directive and its implication on day-to-day management. Mr Clark said: "Sharing experience is something we believe is extremely important at Aviagen. These events brought together customers from the Czech Republic and Slovakia, who enjoyed the opportunity to come together to share their expertise and experience and listen to Nigel Joice who, as well as being a very successful poultry farmer is also Vice Chairman of the UK National Farmers Union Poultry Board. Nigel also sits on the Technical Advisory Committee to the Assured Chicken Production so he is extremely knowledgeable and is able to speak as an industry professional and an understanding farmer. Conducting seminars with a difference, whether they be with renowned external speakers or providing hands-on demonstrations, offers real value to our customers." Lída Víchová, broiler Technical Service Manager of Best, one of the largest broiler breeding companies in the Czech Republic said: "Many thanks for such a perfect meeting. My customers liked it very much. It was different than the other seminars, thanks to Nigel Joice. He shared his practical experience from the broiler farm with us and this generated many questions and discussions. We will certainly be referring back to Nigel's presentations when we return to our own farms. The thermal imaging technology offers farmers the opportunity to check the quality of their insulation and hopefully reduce costs. We all look forward to seeing this technology being used on our own farms when Aviagen next visit."